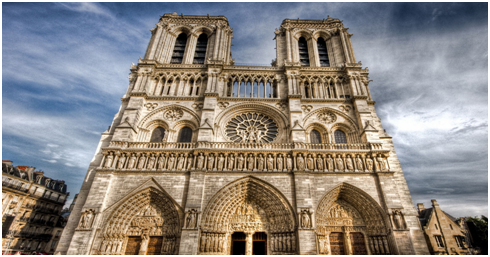 Notre Dame de Paris is a Gothic-style Christian church that is a symbol of ancient Paris. It stands on the banks of the Seine and is located in the heart of the entire city of Paris. Its status and historical value are unparalleled and it is one of the most brilliant buildings in history. The church is famous for its Gothic architectural style, the carving and painting art, and the numerous art treasures of the 13th to 17th centuries hidden in the church. Although this is a religious building, it shines with the wisdom of the French people and reflects people’s pursuit and yearning for a better life. Notre-Dame de Paris began construction in 1163 and was not completed until 1345. It was the first monumental cathedral built in France and was given a gothic style. It is 420 feet and has two towers that are 226 feet. The cathedrals spire was not a part of the original design and was added in the 19th century. The Gallery of Kings, which are statues that depict 28 Judean Kings, is located on the frontal west facade. Gargoyles are located higher up, above the statues. The cathedral was severally damaged during the Revolution but was restored in the 19th century. The Vatican is the home of the official residence of the Pope, the Vatican Palace, and is referred to as the “seat” of the Roman Catholic church. It is an independent nation that is a collection of buildings and is known as Vatican City. It includes St. Peters Basilica, the Sistine Chapel, and the Vatican Museums and Galleries.